Troo Health’s Cranberry Tablets provide a high dose 5000mg tablet as a convenient daily supplement to support a healthy urino-genital tract, kidneys and bladder. Cranberry contains essential minerals including magnesium, phosphorus, potassium, calcium, iron and copper. Cranberries also have a high content of Vitamins A, B and C.
Cranberry tablets are commonly used to help support urinary tract health. Troo Health Care Cranberry Tablets are manufactured in the UK to GMP code of practice and ISO 9001 quality assurance certification. Only the finest quality raw materials in their highest and purest form are used. These manufacturing procedures ensure that the basic manufacturing practices and prerequisites necessary for product quality and safety are being followed. This goes above and beyond what is required so that we can guarantee you receive consistently high quality products. 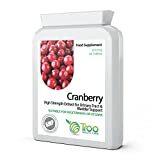 Cranberry Extract 200mg 25:1 (Equivalent to 5000mg Pure Herb) provide a high strength cranberry supplement in a convenient and easy to use daily tablet. The cranberry fruit is packed with minerals, including significant measures of potassium, copper, magnesium, calcium, phosphorus and iron. Iodine provides Cranberries with their ruby red colour. Naturally potent in the antioxidant A and C vitamins, Cranberries also provide traces of many B vitamins. The most active ingredient however is cranberry’s high organic acid content. Troo Health Care Cranberry Tablets are manufactured in the UK to GMP code of practice and ISO 9001 quality assurance certification. Only the finest quality raw materials in their highest and purest form are used.